An analysis of the potential climate change mitigation impact of the project entitled Agricultural Development and Value Chain Enhancement Activity II (ADVANCE II) in Ghana shows that an approximate reduction in greenhouse gas (GHG) emissions of 100% will be possible. When project targets are achieved, ADVANCE II will transform the project area from a low net source of GHG emissions to roughly carbon neutrality. *  ADVANCE II is estimated to achieve moderate GHG mitigation benefits that are driven by soil management improvements (-9,223 tCO2e/yr), crop residue burning reductions (-4,249 tCO2e/yr), and alternate wetting and drying (AWD) of irrigated rice (-858 tCO2e/yr).  The moderate increase in fertilizer and pesticide use supported by the project leads to small increases in GHG emissions (1,244 tCO2e/yr and 2,514 tCO2e/yr respectively).  ADVANCE II provides important benefits for low emission development (LED) by significantly reducing the crop GHG emission intensity (GHG emissions per unit of production). This is achieved mainly through strong growth in agricultural productivity and reductions in postharvest losses. Grewer U, Bockel L, Nash J, Galford G. 2016. 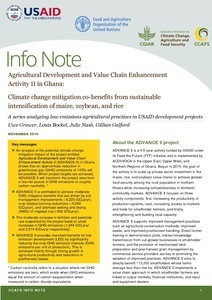 Agricultural Development and Value Chain Enhancement Activity II (ADVANCE II) in Ghana: Climate change mitigation co-benefits from sustainable intensification of maize, soybean and rice. CCAFS Info Note. Copenhagen, Denmark: International Center for Tropical Agriculture (CIAT) and the Food and Agriculture Organization of the United Nations (FAO).